The Man in the Iron Mask / Royal Straight Flush!! English Title: The Man in the Iron Mask / Royal Straight Flush!! 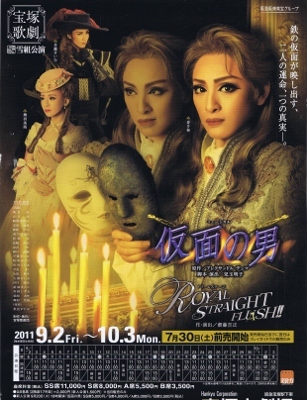 Japanese Title: 仮面の男 / ROYAL STRAIGHT FLUSH!! Romanized Title: Kamen no Otoko / Royal Straight Flush!! Based On: Alexandre Dumas' The Man in the Iron Mask, book three of The Vicomte of Bragelonne; the last of the d'Artagnan Romances. ※ Because of changes made to the script, * indicates roles from the Grand Theater performance and ※ indicates roles from the Tokyo performance. Based on Alexandre Dumas' work — a continuation of The Three Musketeers, which was made famous in a film with Leonardo DiCaprio. Set at the royal palace in 17th-century France, with Louis XIV's twin brother the prince working alongside d'Artagnan and the Musketeers — a swashbuckling adventure of love, friendship, suspense and action. The time is the 17th century. Under the merciless rule of King Louis XIV, the people of France are forced to live a meager existence, lacking even their daily bread. Athos, Porthos and Aramis were three heroic figures known as the "Three Musketeers" who served under the previous King, Louis XIII. They have since left the Royal Guard and are now leading their own separate lives. Meanwhile, D'Artagnan, who previously fought alongside the musketeers, is serving under the current King as commander of the Guard. One day, King Louis' eyes fall upon a beautiful woman. Her name is Louise de la Valliere, and she is the fiancée of Raoul, brother of former musketeer Athos. But the King won't be satisfied until she belongs only to him, and so he devises a scheme to make that possible, by whatever means possible. Athos, Porthos and Aramis are drinking at a tavern in the town when they suddenly run into D'Artagnan. But he adopts an aloof attitude, despite the reunion coming after such a long separation. Since the death of his lover Constance, D'Artagnan has become a different person, withdrawn from the world. On the order of Louis XIII's consort Queen Anne, Constance had been put under the care of "a certain person of the nobility" in a remote part of the countryside. It turns out that someone had ended her life several years ago. D'Artagnan plans to find out the truth of the matter eventually and is determined to avenge Constance's death. Not long after Louis first sets eyes on Louise, Raoul is jailed as a dangerous anti-monarchist. She visits the King in a bid to clear up the charge against her lover. However, as a condition by which Raoul can be helped, Louise is given an option - that she serves as a maid-in-waiting by the King's side. The dungeon where Raoul was taken houses a mysterious man. His face is covered by an iron mask, and his situation is known to no one. Raoul manages to get a glimpse of the man's face - the spitting image of King Louis. He is Philippe, Louis's twin brother, and his existence has been shrouded in darkness. Philippe had been removed from the royal family shortly after birth so as not to bring harm to it. He has since been living in silence, with no human contact. Aware of Philippe's existence, Louis covered his face with the iron mask and locked him away in the dungeon. Raoul, who is aware of the biggest secret surrounding the King, is shortly to be sent to the gallows. Drained of hope, Raoul writes a letter to his brother in an attempt to somehow convey the secret before he is executed. The letter ends up in the hands of Athos, who is shocked to learn the truth. Enlisting the help of Porthos and Aramis, he draws up a plan to rescue Philippe, the man in the iron mask. Athos considers ways of deposing Louis - who has framed another man merely out of his own greed - and of secretly installing Philippe on the throne. Athos, Porthos and Aramis, the old Three Musketeers, reunite and head to the dungeon. They slip past the watchful eye of the jailer and succeed masterfully in extricating Philippe. Liberated from a life spent in jail and wearing an iron mask, Philippe thanks the Three Musketeers. However, he reveals his distress over the fact it would impossible for him to take Louis' place and become King. Philippe considers leaving the Three Musketeers, but he is admonished by Aramis, and eventually he comes to terms with his critical mission. Philippe takes advantage of his resemblance to the King to enter a palace banquet, and now his strategy of taking the place of the King of France gets under way. The capable D'Artagnan is constantly by Louis' side. But will Philippe be able to free himself from the stigma of the mask and become the true King of France? A "royal straight flush" is the highest winning hand in the card game of poker, making it synonymous with "unbeatable" — the strongest victory. Life can also be called "a grand game"; this magnificent revue represents the emotions of life as a game, focusing the spotlight on brave winners and dramatic yet beautiful losers in splendid developments. Twenty-eight rocket dancers announce the opening with a song full of energetic emotions and dancing like the shuffling of cards, while the Joker and Ace of Hearts enter. The fantasy begins with lively singing. The 10, Jack, Queen, and King of spades appear and gaily sing and dance. An original prologue, based on a medley in which various star cards competitively unfold with beauty and skill. The stage becomes increasingly even brighter as the cards dance splendidly en masse. Alice, a lost child, is guided by rabbits into the studio of the star discovery program, "American Bandstand", where she meets a cleaning lady. At the the cleaning lady's suggestion, Alice jumps into the program and battles with various rising stars introduced by the esteemed master of ceremonies, Avalon. - Who will have the winning hand!? The Rabbits are the same from Scene 3. Western-K tries to seduce the star contest winner, Alice, by any means possible. The Rabbits are the same from Scene 3 and the Male Talent Singers, Female and Male Talent, Female and Male TV Staff are the same from Scene 4. Western-K, who has returned to his homeland of Texas, discovers that his former love has become the mistress of a scoundrel. - For the sake of regaining her stolen smile, Western-K challenges him to a battle. Western-K leaves behind his hometown of Texas again. Rider girls hitchhike towards Las Vegas. Las Vegas' showtime. A dance with high-class casino club dancers. A magician's splendid magic show. A wild animal show with animal trainers. A parade with various characters. The Rabbits from Scene 3, the Classic Dancers from Scene 9A, the Models from Scene 9B, Animal Tamers, Wild Animals, and Show Girls from Scene 9C are all the same. A pirate show where a prince saves a princess captured by the leader of the pirates. The prince and princess's duet dance. A highlight scene unfolds, filled with dynamic numbers based on Las Vegas' magnificent and dazzling shows. A 10, Jack, Queen, King, and Ace of Spades make a ROYAL STRAIGHT FLUSH!! The first official Grand Theatre show for top combi Otozuki Kei and Maihane Mimi. The two previously starred alongside each other in Romeo & Juliette; however, no top musumeyaku had been named at the time. Final performance for Ayana Oto, Haruka Midori and Oonagi Mao. Created by lokai. Last Modification: Wednesday 11 of June, 2014 09:48:36 PDT by kyanited.